Phoebe has gotten a bad rap on this blog. Over the last 98 blog posts I have described Phoebe as paranoid or as having a wail so terrible it makes you want to cut off your ears. I’ve called her a bawl baby, stubborn, pathetic, ridiculous, booger, a grain fiend, a spawn of evil, and I’ve compared her to a brat in the candy aisle of the grocery store who isn’t getting their way. Yikes! Now that’s a lot of bad press! But something funny has happened with Ol’Phoebs and I since I last wrote about my hatred for her. It probably comes down to the fact that we spend a lot of time together now. She munches happily on her oats and I tuck in close to her flank and milk her. Every night the same routine. I was milking her twice a day but with me going back to work, once a day milking was easier, and Phoebe was more then willing to cut down to once a day milking too. So as the sun goes down we trot off to my screened in porch (I swear half my farm has lived in there at one point or another), and she munches and I milk. Gone are the days with screaming and kicking and flailing about. Gone are the days when she tries to poop on me when I milk her (although she still farts every now and then), gone are the days of me always having to chase her and corner her to catch her. And gone are the days of me wondering what on earth I have done. Since Phoebe has gotten nothing but bad things said about her I figured it was time to tell you about Phoebe. The whole story. 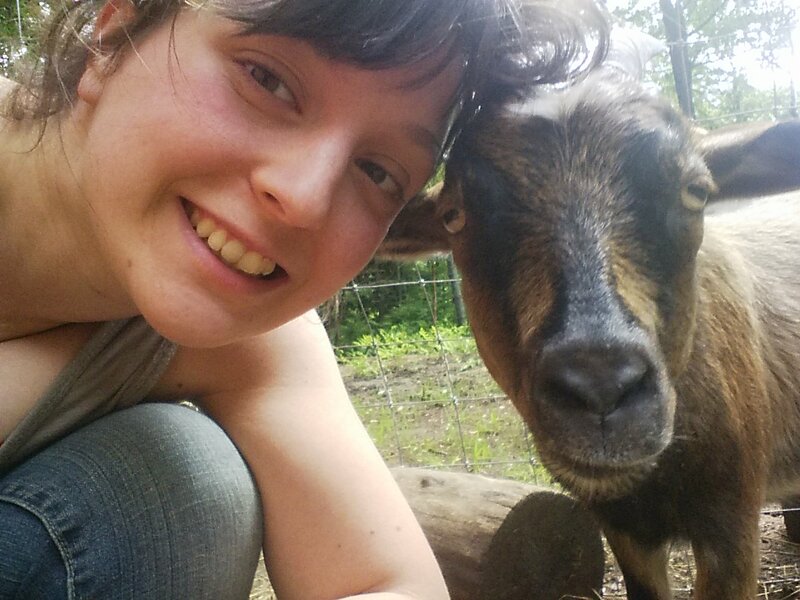 Phoebe was my first goat. I had the name picked out 3 months before I even met her. 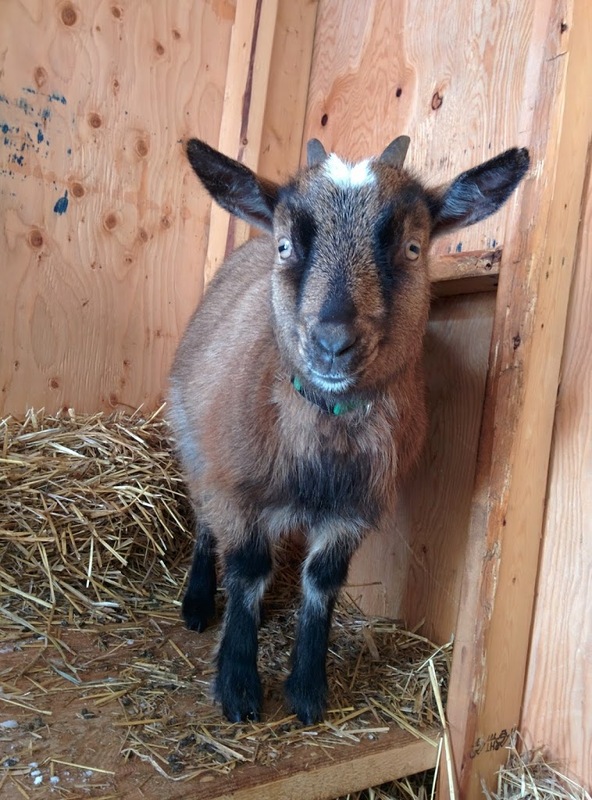 I first saw her picture on Kijiji – 1 female Nigerian dwarf goat for sale, brown with white star and black strip. She was the exact colouring I had been hoping for too. I hummed and hawed over whether to respond. This was right when we found out we would be moving and the timing was bad. The next day the ad was gone and I was bummed that I lost my chance. Until 2 days later when the ad appeared again. I didn’t even think it through, I just sent the email and by that evening I was driving around, lost, trying to find the farm where she was. I showed up a half hour later then I was supposed but thankfully the lady selling her was very gracious about it. That lady went on to become my friend Sal (Sal is mentioned in this post. It was her farm that I took both does back to to be bred). At this point the only farm animal I had had was chickens, but Sal was awesome about answering any questions. Hubby and I were there for over an hour talking about goats. Phoebe wouldn’t even come over to see us. 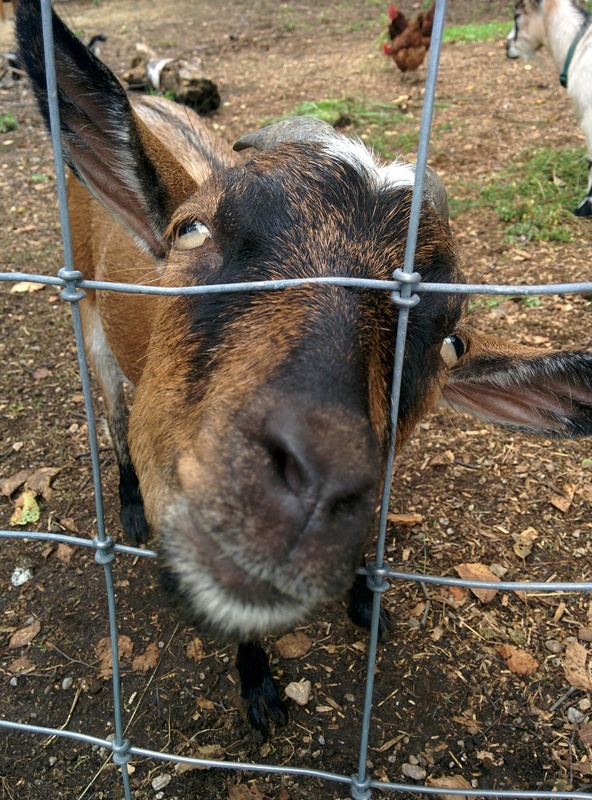 All the other goats in the pen were friendly and come over to greet us. Phoebe couldn’t care less that we were there. She stuck right to her Mama’s side and ran away whenever we tried to get close to her. She was beautiful though, and so I told Sal I’d take her. Phoebe had to stay with her Mama another month, which gave us time to move and just barely get the little goat barn up before she arrived. (Actually the goat barn was finished 3 hours after she arrived). Phoebe did not settle in well. She was very unfriendly, and skiddish. She missed her Mama, and her new herd mate Sophie, whom she had never met before, kept beating her up. Life with Phoebe was pretty rough the first 9 months. It wasn’t until winter time, when she was pregnant, that she started coming around. Poor girl was cold and tired and growing bigger by the day. By spring she was massive, and couldn’t bend to scratch herself, or clean herself. I helped her out a lot those last few weeks. I also paid special attention to her to make sure her pregnancy was progressing normally and she got used to me checking her tail ligaments, and touching her belly to feel the baby kick. When she went into labor I was there. I sat with her for over an hour, talking her through her contractions, and I pulled Hiccup out when his gigantic head got stuck. And then one day she stopping kicking on the stand. Then she stopped yelling. Then she didn’t run away from me when I tried to catch her. And now I don’t even have to lock her into the milk stand. She just stands and munches. She doesn’t pull away until I give her 2 pats on her rump and tell her good girl. She eagerly waits for her treat, that I always give her, after I’ve milked her. And sometimes we just sit there together, she munches and I pet her and talk to her and tell her she’s pretty. This has been a very very long journey with Phoebe. It’s taken a year and a half of tears, determination, and stubbornness (both hers and mine) to get here. There has been many times I’ve thrown my hands into the air and yelled to the heavens I quit. Early this summer I even wrote a blog post about how the goat era was over. Finished, I’d had enough. But then my Hubby told me we weren’t getting rid of the goats after all of this effort and we had to find a way to make it work. And we did. Some nights the last thing I want to do is milk the goat. Not because it’s hard, but because it’s just one more thing that needs to be done. But when I head out the door at dusk and see her standing at the fence quietly waiting for me, and we go about our usual routine it is pretty special. That curl on top of Phoebe’s head is actually my hair, and I have no idea what it’s doing. So here are some good things about Phoebe: She is the first one to come and see me at the fence. She is curious but not in the overly pushy way that Sophie is. 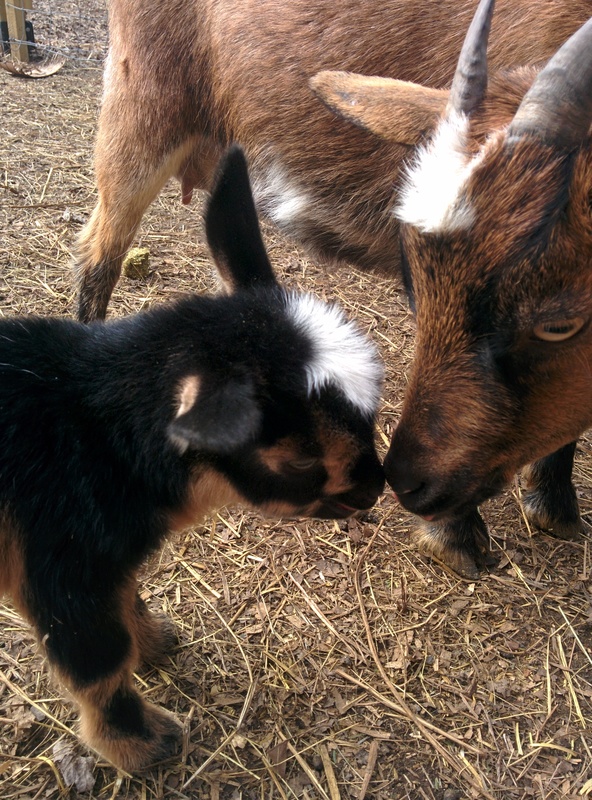 She never tries to ram open the gate and escape, she adopted our newest goat into the herd without much fuss, she likes to play, her milk is ridiculously creamy, and she’s content to just sit with me. 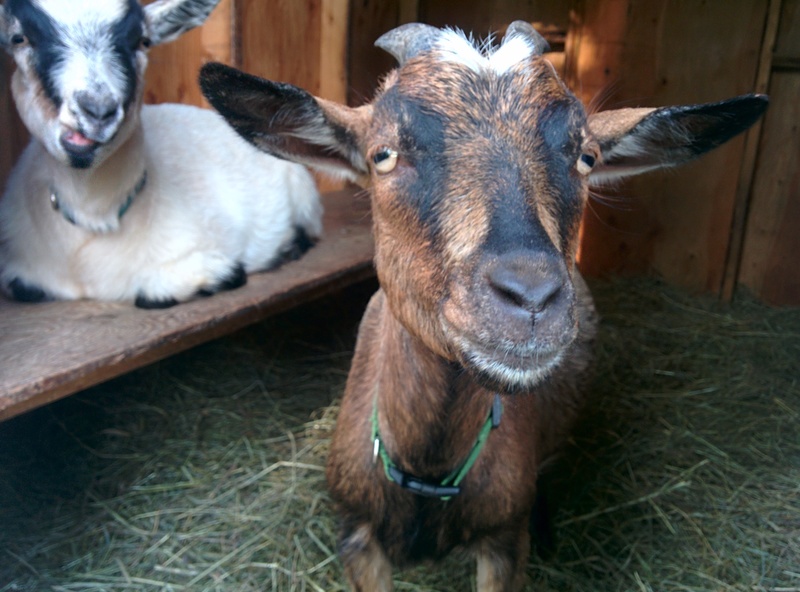 She’s also the most photogenic of all the goats because she will actually stand still. So life with Phoebe is pretty great. For now anyways.